Henley Beach is home to one of Adelaide’s best kept secrets. Acacia brings a fine dining experience to the sandy shores of Henley Beach and brings forth a brand-new feel to this otherwise casual seaside. Adelaide Food Central were invited to enjoy a seven-course meal curated by their brilliant head chef, Duane Tilka. 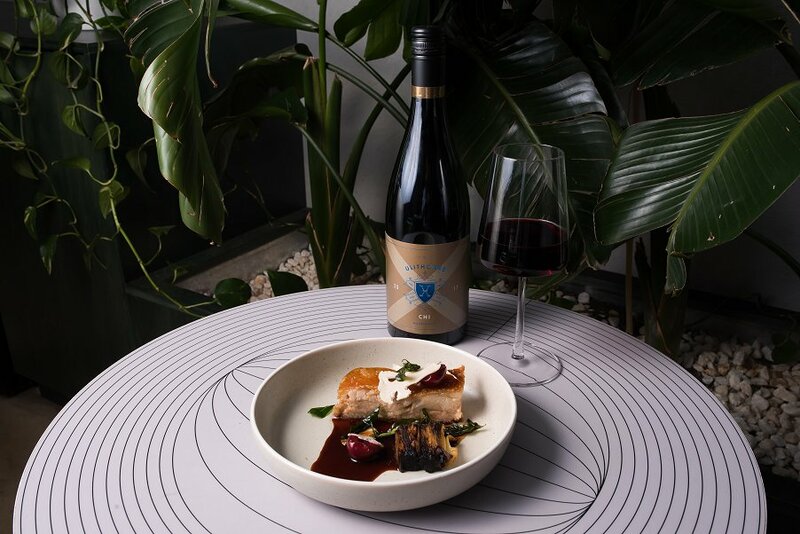 Each dish was paired with a complementing wine from Ulithorne Wines in McLaren Vale. “It’s simple food. We tasted the wines and then culminated the dishes to go with them. 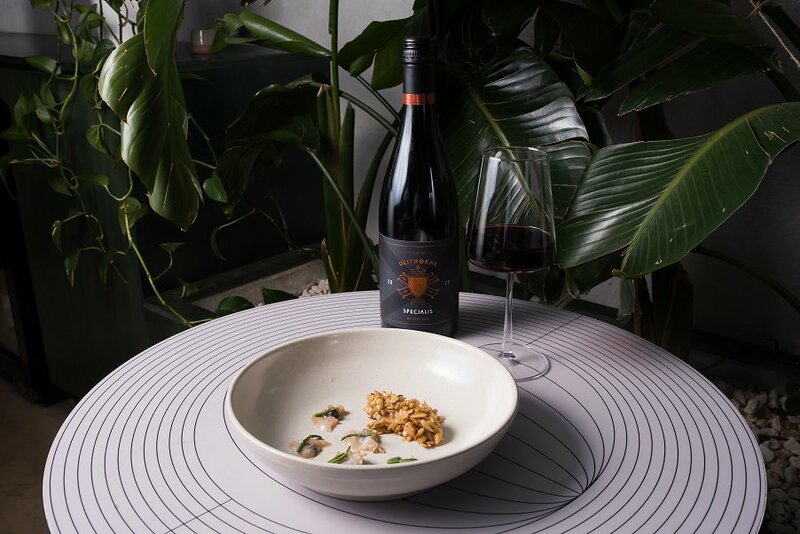 We then tasted the dishes with the wine until we had the perfect fit.” Said Duane about the process of find the perfect food and wine pairing. So much thought and hard work went into making our dinner spectacular, Duane and his team have truly made Acacia a hot spot for Henley Beach. To start, we were treated with a portion of tender squid with pickled celery and a salty miso reduction. The dish was refreshing and showcased so many flavours. The pickled celery added crunch to the soft squid, the miso complementing it all with a zesty saltiness. 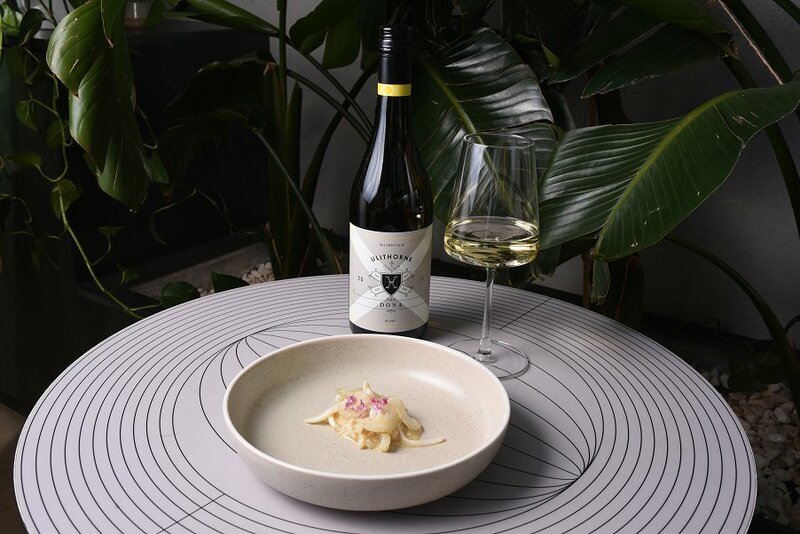 This dish was paired with the ‘DONA’ Blanc 2017, a white wine with citrus and stone fruit flavours. This wine went perfectly with the salt and pickle flavours from the dish. Acacia keeps to the current trend of serving succulent raw Kingfish. 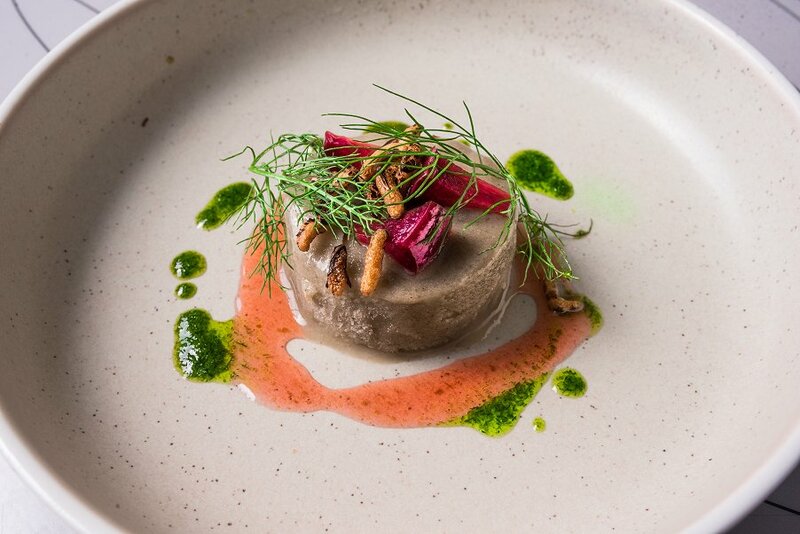 This dish was vibrant with taste and colour. The fish was silky in texture and almost creamy in taste, pairing very well with the acidic flavours from the beetroot dressing and fresh strawberries. 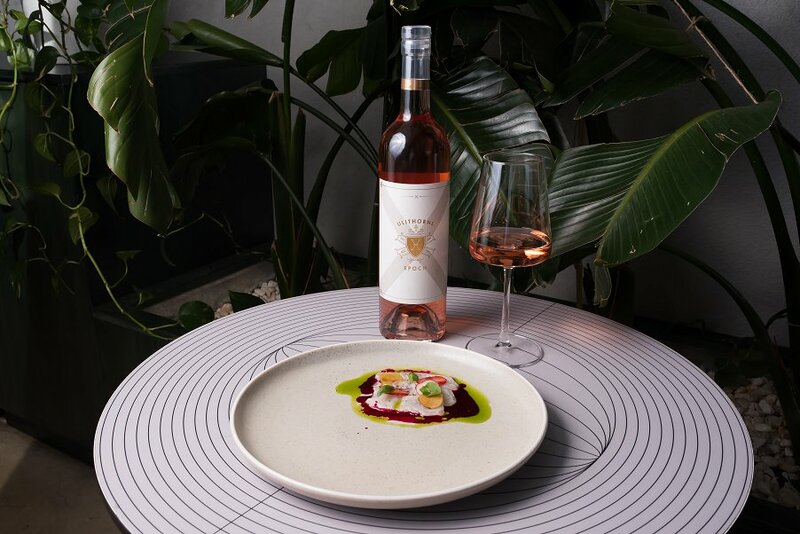 We tried a glass of ‘EPOCH’ Rose 2018 with this dish. The sweet red berry flavours from this wine went well with the strawberries and fresh fish in this dish. This dish was packed with amazing flavour and texture. The fine crunch from the sunflower seeds went well with the softness from the cockles and tomato. We loved the hint of sour from the dressing that was contrasted with the subtle sweetness from the tomato and sunflower seeds. We drank the ‘SPECIALIS’ Tempranillo Grenache 2017, a juicy red wine that added depth and warmth to the dish. This dish served as one of our favourites. Melt-in-your-mouth pork with amazingly crispy crackle was paired with a rose hip and cherry jus. Garlic and potato terrine along with thoughtful shavings of crunchy cauliflower bring this dish to life with texture. The pork is well seasoned and delicious, going well with the sweetness from the rose hip and cherry jus. 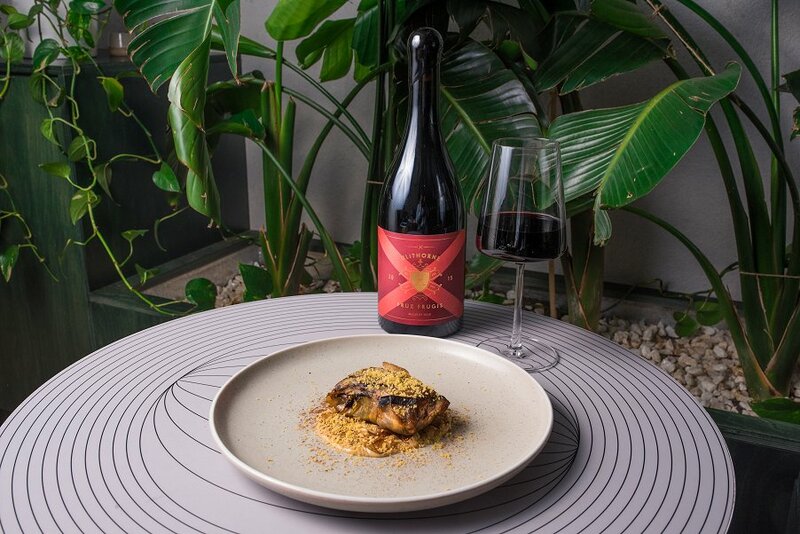 ‘CHI’ Shiraz Grenache 2017, a hearty wine with woody notes gave something extra to this dish and complemented the salty pork perfectly. Slices of torched lamb were placed delicately and paired with fermented blueberries and melted creamy garlic butter. The meat was juicy and had sweetness, pairing well with the berries and saltbush. We loved the sweet and sour elements to this dish. 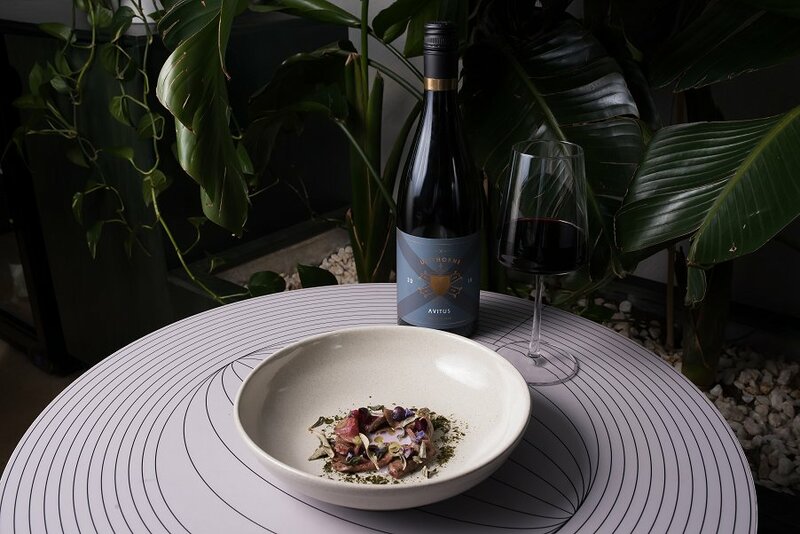 ‘AVITUS’ Shiraz 2016 was oakey and hearty, always perfect with lamb and red meats. Tender beef chuck was glazed with a creamy yolk sauce and sprinkled with crisp potato flakes and crunch leeks. The meat was so soft and juicy, we couldn’t get enough of it! We loved the subtle hint of spice with this dish and the many textures. Paired well with the ‘FRUX FRUGIS’ Shiraz 2015, a dense shiraz with a lot of body and flavour, this dish was magnificent. A refreshing dessert to end our fabulous feast, this koji sorbet was creamy and light. Barley Koji is a fermented speciality food from Japan. We loved the flavours from the sweet plum and fennel mixed with the soft sorbet, paired with a small glass of Japanese Saki. This dessert cleansed out palettes and finished our experience at Acacia perfectly. Acacia is open Monday-Thursday from 7.00am-4.00pm, Friday-Saturday 7.00am-9.00pm and Sunday 8.00am-4.00pm. We thank Acacia and Ulithorne Wines for the lovely night and can’t wait to do it all again soon!